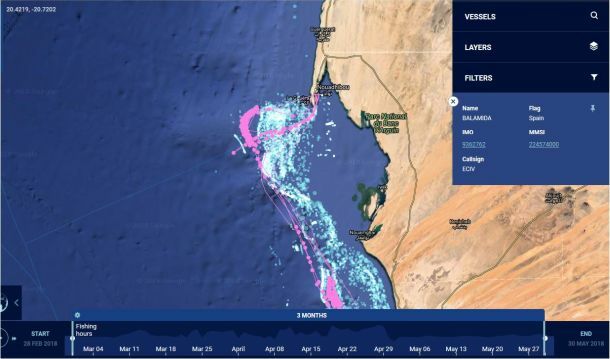 Several EU-flagged vessels have blatantly ignored and violated the EU Court judgment invalidating the EU-Morocco fish agreement in Western Sahara. Here they are. "At the present, no EU fishing vessel can operate legally under the EU Agreement with Morocco in waters adjacent to Western Sahara", said Vincent Piket, Head of the Maghreb Division of the EU External Action Service in a seminar on EU-Morocco relations, hosted by the ALDE group in the European Parliament on 25 April 2018. Two months earlier, the Court of Justice of the European Union (CJEU) had concluded that the EU-Morocco Fisheries Partnership Agreement could not be applied to Western Sahara. Western Sahara, the Court stated, does not fall under Moroccan “sovereignty or “jurisdiction”, and is not part of “Moroccan fishing zones” – a notion used throughout the Agreement and its implementing Protocols. 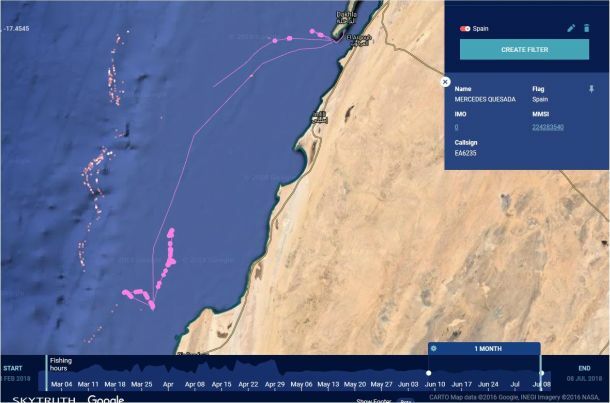 Western Sahara Resource Watch has monitored the fisheries practices in the territory since that ruling and can affirm that the vessels below have gone on to fish in the waters off occupied Western Sahara after the EU Court had ruled on the matter. 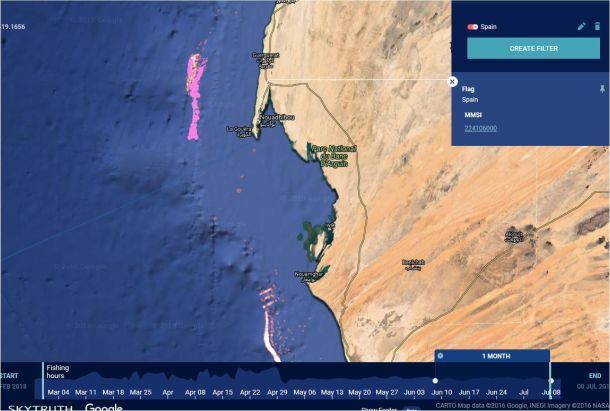 The graphics below - taken from the website Global Fishing Watch - show images of several Spanish vessels clearly fishing in the Western Saharan waters, while several other vessels - French, German, Danish and Spanish - fishing on both sides of the maritime boundary between Mauritania and Western Sahara. 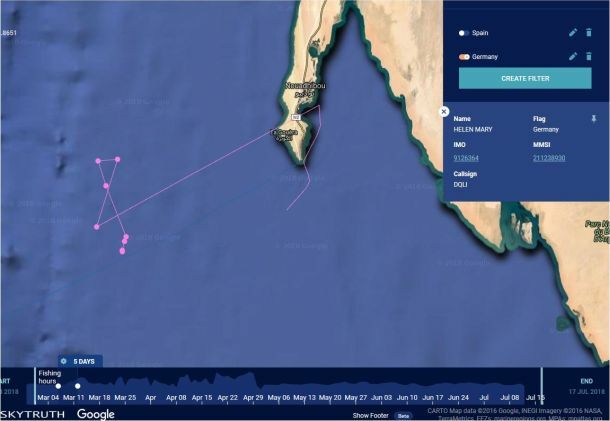 Four Spanish trawlers have been spotted in the southernmost waters of Western Sahara in June 2018: Catrua (IMO 9212618, MMSI 224355000) , Curbeiro (IMO 9194191, MMSI 224106000), Isla De Santa (IMO 9192806, MMSI 224292000) and Mercedes Quesada (IMO unknown, MMSI 224283540). 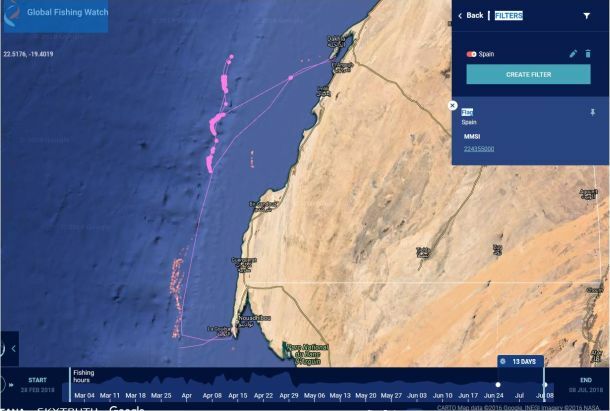 In addition, the following fishing vessels have been spotted crossing the maritime boundary between Mauritania and Western Sahara, to fish in the latter: Balamida (Spanish, IMO 9362762, MMSI 224574000), Funcho (Spanish, IMO 9230701, MMSI 224266000), Hermanos Delgado (Spanish, IMO 8739932, MMSI 224026860), Cap Mauritanie 1 (French, IMO unknown, MMSI 227827000), Helen Mary (German, IMO 9126364, MMSI 211238930), Monsun (Danish, also uses the name Sebastian, IMO 8522406, MMSI 219340000). 1. Has the European Commission informed Member States of the practical implications of the ECJ ruling of February 2018 for EU fishing vessels in Western Sahara? 2. Has the European Commission instructed EU-based vessels to leave the waters of Western Sahara in response to the ECJ ruling of February 2018? 3. Is the European Commission aware of illegal fishing by EU-based vessels in the waters of Western Sahara? 4. Does the European Commission intend to ask the relevant EU Member States for clarification? 5. Will the European Commission raise the issue with the authorities of Mauritania? 6. What course of action will the authorities of the EU Member States concerned by the above-mentioned information take in order to uphold European and international law? The Catrua, fishing in the southern part of the waters adjacent to Western Sahara, between 25 June and 7 July 2018. The vessel seems to call into the port of Dakhla, and that of Nouadhibou (Mauritania). The Curbeiro, fishing off La Güera, on the southern tip of Western Sahara, in June 2018. 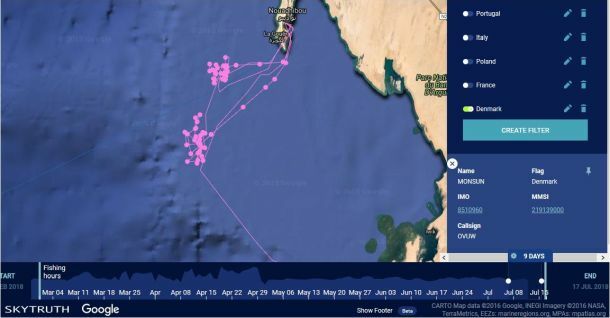 The Isla De Santa, making repeated trips to the port-area of Dakhla, after having fished further south in Western Sahara, in June 2018. The Mercedes Quesada, fishing in the southern parts of Western Sahara, and making calls into the Dakhla port area, in June 2018. The Balamida, crossing the maritime border between Mauritania and Western Sahara, displaying fishing patterns in the waters of Western Sahara post 27 February 2018. The Funcho, displaying fishing patterns just north of the maritime border separating Western Sahara from Mauritania, post 27 February 2018. 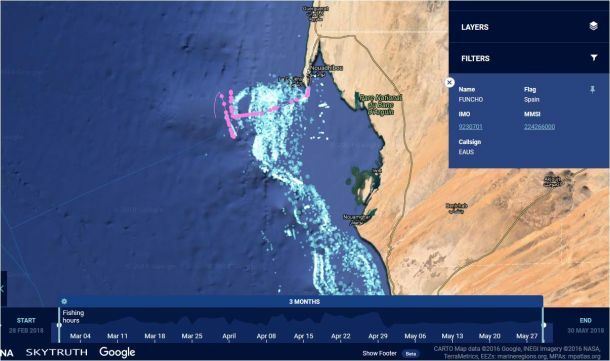 The Hermanos Delgado fishing in Mauritania, yet making a quick trip north into the waters of Western Sahara, post 27 February 2018. 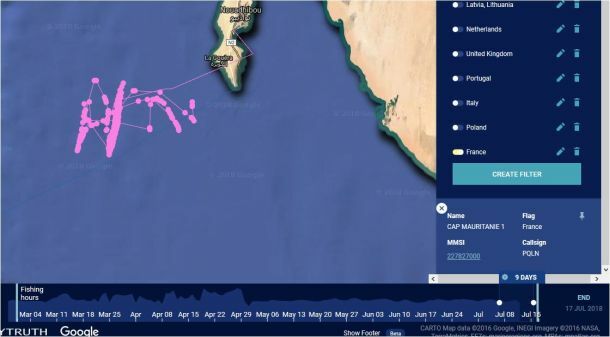 French-flagged vessel Cap Mauritanie 1 making a fishing trip exclusively north of the maritime boundary between Western Sahara and Mauritania, in the third week of July 2018. German-flagged vessel Helen Mary fishing north of the maritime boundary between Western Sahara and Mauritania, in early March 2018. The following two images show the Danish-flagged Monsun. 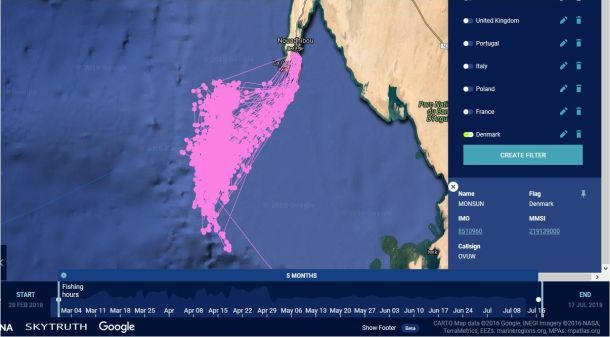 The first image displays a fishing trip the vessel undertook just last week, crossing the maritime boundary with Mauritania into Western Sahara. The second image reveals that this is not an isolated incident, as is evident by the vessel’s fishing patterns post 27 February 2018 which regularly cross into Western Sahara.